Leveraging on our vast industry experience, we are providing a high quality range of Chocolate Fountain. We offer Chocolate Fountain Machine to our clients. 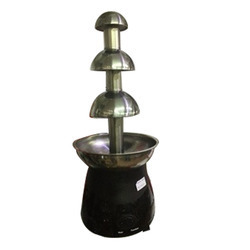 To furnish the diverse requirements of our clients in the best possible manner we are involved in offering an extensive range of Mini Chocolate Fountain Machine. To satisfying the varied demands of clients, we are highly engaged in offering optimum quality Chocolate Fountain Machine in the market. For the complete satisfaction of the clients, we are providing optimum quality Chocolate Fountain Machine. This Chocolate Fountain Machine is extensively used by the clients for its elegant look and attractive designs. We also keep the various demands and requirements of our precious in our mind while developing the range. We are introducing the new Cascade Chocolate Fountain, with a unique design that entices customers. Not only does the SQ4 Cascade offer a unique new style, it also creates a talking point and up market alternative to a standard chocolate fountain.